Brendon M. Wilkins is currently a student at the University of North Texas pursuing a double major in Instrumental Music Education and Instrumental Jazz Studies, in Classical Flute and Jazz Saxophone respectively. Brendon has experience in a variety of ensemble settings. In the past five years, he has played in collegiate and professional musical theater pit orchestras, marching bands, wind ensembles, big bands, rock ensembles, pop groups, and jazz combos in addition to his work as a woodwind soloist. Brendon has previously studied jazz with Mark Vinci, and classical flute with Jan Vinci. 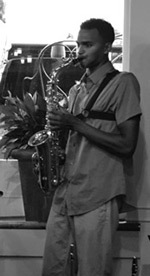 Brendon currently studies flute and piccolo with Mary Karen Clardy, and jazz with Brad Leali. After the completion of his undergraduate study at the University of North Texas, Brendon plans to pursue a Masters of Music in Multiple Woodwinds.